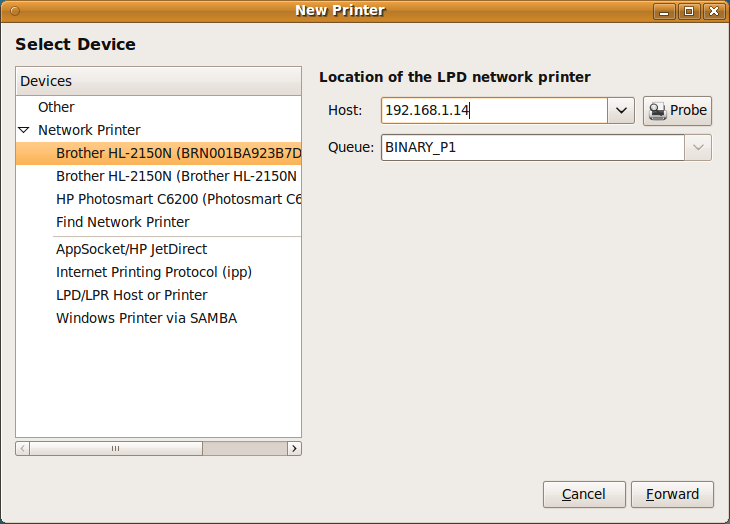 Whilst there is no official support for this printer model in Ubuntu 9.10, it can be set up to work via Ethernet fairly easily. Open the printing administration utility and create a new printer. Hopefully the printer will be discovered automagically thanks to mDNS. You may need to expand the Network Printer section. The printer will likely show up twice. Select the LPD version, not IPP. Change the Host field to the hostname or IP address of the printer. When prompted for a driver, use the Brother HL-2170W Foomatic/pxlmono option. Do you have to download the driver from somewhere?